Everybody expected mixed-reality technology to play a part in Microsoft’s big Windows 10 event on Wednesday—but nobody expected what we got. Rather than showing yet another HoloLens demonstration, Microsoft instead announced a small army of virtual reality headsets unlike anything available today, and they’re all powered by the forthcoming Windows 10 Creators Update. The demo raised more questions than it supplied answers, but there was still plenty of info to glean if you were paying attention. Here’s everything we know about Microsoft’s Windows 10 VR headsets—and one massive question spurred by their mere existence. Seriously, Today’s mobile VR headsets (like the Gear VR and Daydream View) can track your head’s rotation, but not its position in space, making mobile VR a stationary experience. PC-powered VR (like the Oculus Rift and HTC Vive) can track both head rotation and position, but require the use of extra “base stations” that cast out invisible laser beams to keep tabs on your movement across space. Windows chief Terry Myserson says the new Windows 10 powered VR headsets use “inside-out six-degree-of-freedom sensors.” That means they’ll be able to track their own position with internal sensors, negating the need for base stations and dedicated VR spaces. No currently available VR headset offers that flexibility. The closest we’ve seen is the Santa Cruz prototype revealed at Oculus Connect earlier this month, but it’s far from finished, with Facebook CEO Mark Zuckerberg stressing that Santa Cruz is more idea than reality at this point. 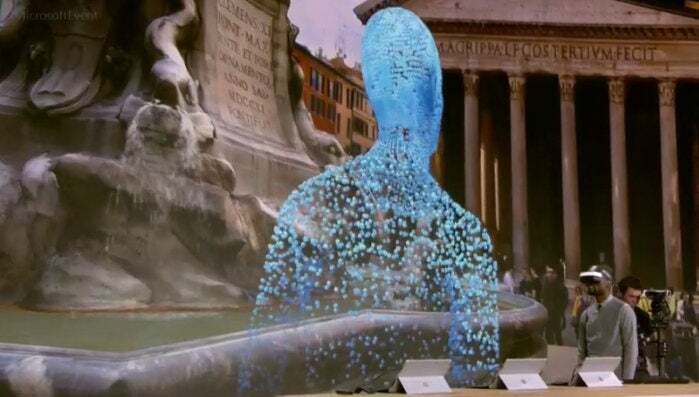 The HoloLens overlays 3D holograms atop the real world, providing an experience totally different from traditional virtual reality. That said, HoloLens head Alex Kipman told Polygon that the new Windows VR headsets borrow their inside-out technology from Microsoft’s augmented reality device. The Windows 10 headsets can’t quite shake all of PC-based VR shackles, it seems. Unlike Microsoft’s HoloLens (and Oculus’ standalone Santa Cruz prototype), it appears as though these incoming devices lack on-board computers, requiring them to be tethered to a PC—somewhat of a bummer after the excitement about inside-out sensors. During an on-stage demonstration, the host’s headset clearly sported a long wire, and a promotional image for these headsets shows a discrete connection to a laptop in the background. This raises some interesting questions. How powerful will the PC powering these Windows 10 headsets need to be? Full-blown VR is much more graphically demanding than the HoloLens’ augmented reality. The laptop in the image doesn’t appear bulky, but Nvidia’s new GTX 10-series mobile chips are powerful, yet cool enough to drive virtual reality experiences from relatively svelte notebooks. Comments Kipman made to Polygon suggest the requirements won’t be particularly beefy. “We’ve lowered the specs you need for a [VR-ready] PC from a $1,500 system to a $500 one,” he said. Microsoft will reveal more detailed info at an event in December, Kipman says. These “Windows 10 Creators Update accessories,” as Myerson calls them, may be different from the HoloLens but it appears they’ve picked up some tricks from Microsoft’s augmented reality device. During Microsoft’s on-stage demo yesterday, the Windows 10 VR headset was controlled using voice commands and hand gestures, similarly to how you control the HoloLens. No obvious in-hand controllers were visible. You can’t help but wonder if these more affordable, tethered VR headsets will stand in as “consumer HoloLens” alternatives until Microsoft’s able to perfect the design of its headset and drive the cost of its standalone design down to more reasonable levels—which may take years. A slew of PC makers want in on the VR action. 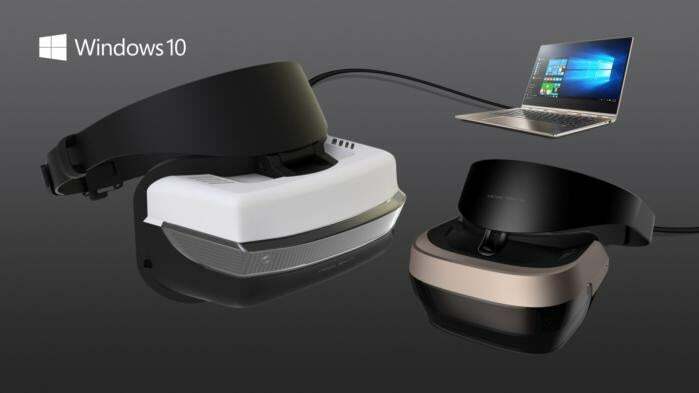 HP, Dell, Lenovo, Asus, and Acer will all offer Windows 10 VR headsets. Here’s hoping Microsoft and its partners institute some quality controls, as janky VR hardware can make you puke in a jiffy. Or at least one version is. Myerson says these Windows 10 VR headsets will start at just $299, compared to $600 for the Oculus Rift and $800 for the HTC Vive. Don’t expect all Windows VR headsets to be that affordable, though. Look for these Windows 10 VR headsets to appear around the launch of the Windows 10 Creators Update, early next year. The big question: What about Oculus? Just last year, Oculus and Microsoft seemed pretty buddy-buddy. Xbox chief Phil Spencer took the stage at Oculus’ E3 2015 event to announce that the Rift would ship with an Xbox One controller, and be able to play Xbox One games on a virtual TV screen. Rampant rumors suggested that rather than building an in-house headset like PlayStation VR, Microsoft would instead tap Oculus as a drop-in solution for the Xbox One. But it looks like things have changed since then. Those Xbox games have yet to materialize for the Rift, and these Windows 10 headsets could very well wind up being the Xbox One’s VR solution. The only time Oculus was mentioned at the Microsoft event was when Myerson tossed shade, stating that “those other, less immersive accessories today cost over $500 dollars” (emphasis his). To be clear, the Rift headset still ships with an Xbox One gamepad, and neither Oculus nor Microsoft have mentioned anything negative about each other. The Rift could very well still become the Xbox One’s VR headset! But the Oculus team’s noticeable absence at Microsoft’s event paired with the natural rivalry between the Windows 10 VR headsets and Oculus’ Santa Cruz headset sure makes you wonder.